The Netherlands have something to celebrate this year – it will be the 60th anniversary taking part in the Eurovision Song Contest. Congratulations! Unfortunately, the last victory could be achieved more than 40 years ago! Of course it was “Ding-A-Dong” by Teach-In in 1975. Nevertheless, the Netherlands do still belong to the most successful countries in the ESC with four victories. Like in the years before the Dutch broadcaster AVROTROS decided internally who to send as representative to Lisbon. This year it’s Waylon, who has already represented the Netherlands as part of the duo The Common Linnets, together with Ilse de Lange. They made one of the best placings for the Netherlands in recent history: #2 with “Calm After The Storm” in Copenhagen 2014. The song became a radio hit and the released album has been sold more than half a million times worldwide. The Dutch public had to choice between five songs of Waylon and the choice felt to “Outlaw In ‘Em”. The original name of Waylon is Willem Bijkerk, born in Apeldoorn in 1980. Waylon learned to play drum, guitar and the piano, as well as singing. The special liking of country music had influence in his whole life. Later on he joined the bands Santa Rossa and Millstreet. As a child he was a big fan of Waylon Jennings. Once he received a telephone call by Waylon Jennings, who invited him to Nashville, Tennessee, USA. Shortly after that Waylon Jennings died. Being in the USA, Waylon recorded his first album. In the year 2005 Waylon took part in the Dutch nation final with "Leven als een beest” together with Rachel Kramer. He participated in “Holland’s got talent” show in 2008. Waylons first single “Wicked Way” , reached #8 in the Dutch charts in 2009. In 2010 Waylon has been celebrated as “Best Newcomer”. The song “The Escapist” reached #27 in the charts. The biggest success came with the participation at the ESC 2014 and the collaboration with Ilse de Lange. The duo split up later on and Waylon concentrated on his solo career. This might a bit unusual tones for a Eurovision entry. But the ESC is open for all kind of music genres. It only matters if the song will appeal to the majority of the jury members and televoters. This entry is good for a long trip on the highway or for a night out with friend. If this entry is the right one for a competition like the ESC is the big question. Waylon has nothing to lose, as he already made a 2nd place. The last victory for the Netherlands is more than 40 years ago in 1975 with “Ding-A-Dong” by Teach-In. 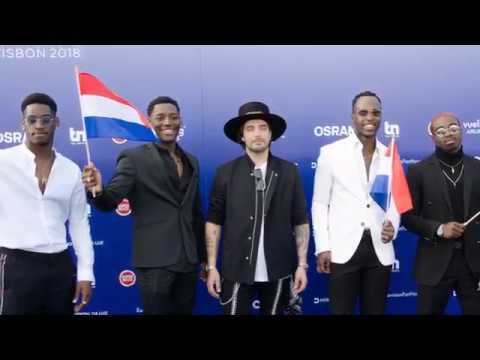 Nevertheless, the Netherlands do still belong to one of the most successful ESC countries, with four victories mainly in the early decades of the ESC: “Net Als Toen” by Corry Brokken in 1957, “Een Beetje” by Teddy Scholten in 1959, “De Troubadour” by Lenny Kuhr in 1969, “Ding-A-Dong” by Teach-In in 1975. Since the first Eurovision Song Contest in 1956 the Netherlands participate on a more or less regular basis. This year it’s the 60th anniversary – congratulation! There have been certain years when the Dutch broadcaster NOS decided to withdraw and the private channel AVROTROS took over. Over the years there were 26 Top10 places for the Netherlands that means that the chances to get a Top10 place in the Grand Final are approximately 43%, which is a relatively good chance compared to other countries. Since the introduction of the Semi Finals, the Netherlands struggled to qualify for the Grand Finals. In the past twelve years there were only five qualifications. Thanks to Anouk in 2013, the interest in the ESC has increased a lot in the Netherlands. She brought back the enthusiasm for the Eurovision Song Contest and made a respectable 9th place in the Grand Final in Malmö. One year later The Common Linnets were able to top that and reached the phenomenal 2nd place with only 52 points gap behind Conchita Wurst from Austria, the Netherlands were very close to victory. Since then The Common Linnets started an international career and their songs are being played in all radio stations. This year the male part of the duo Waylon is going to represent the Netherlands in Lisbon. Last year’s entry “Lights and Shadows” sung by O'G3NE and made another great 11th place in the Grand Final of Kiev, like the year before in Stockholm.